Aja Evans is an actress, known for The Dark Knight Rises (2012), Justified (2010) and Two and a Half Men (2003). Ahney Her was born in Lansing, Michigan, USA as Whitney Cua Her. She is an actress, known for Gran Torino (2008), Batman v Superman: Dawn of Justice (2016) and Night Club (2011). Alessija Lause was born on April 15, 1980 in Bad Aibling, Bavaria, Germany. She is known for her work on Pandorum (2009), Hanna (2011) and Unknown (2011). Alexandra Anthony is a multi-talented actress, writer/director and dancer she has performed all over the world for both stage and screen. Born and raised in a small town in Illinois, Alex grew up dancing and singing. She competed in dance competitions since age six and began her singing career at age 15. Alex graduated from Illinois State University with a degree in Musical Theatre and is now pursuing her career in New York City. Alannah Bowden is an actress, known for Auckland Daze (2012). This blue-eyed beauty was born in Missouri. She started taking dance classes at the age of two, and was performing in recitals and on stage almost immediately. Her pursuit of dance continued through high school with various dance classes and companies. Alexandra Adi was born on April 13, 1971 in New York, USA. She is an actress, known for Cop Land (1997), American Pie (1999) and Eddie (1996). She has been married to Jerry A. Greenberg since 2003. Alex Godinez was born on March 3, 1989 in Hawaii, USA as Alexandra Regina Tabuena Godinez. She is an actress, known for Across the Crescent Moon (2017), Empty by Design and JustKiddingFilms (2007). Alexandra Izzo was born on March 3, 1990 in Scottsdale, Arizona, USA. She is known for her work on Dragon Lair (2016), The Perfect Host (2016) and Secrets of an Agent (2016). Abigail Mavity was born on March 4, 1993 in Mesa, Arizona, USA as Abigail Elizabeth Mavity. She is an actress, known for Final Fantasy VII: Advent Children (2005), Zeke and Luther (2009) and The Onion Movie (2008). Alecia Batson was born on January 30, 1978 in Austin, Texas, USA as Alecia Caylynn Batson. She is an actress and writer, known for Circuit (2009), Interference (2014) and The Donor (2008). Alexandra Aristy is an actress and producer, known for I Didn't Know I Was Pregnant (2008), The Forgotten (2009) and The Heart of Things (2009). As a child Adeyto was fascinated by the Japanese Bushido, arts, sensibility, philosophy and it became her biggest dream to visit Japan as early as possible. She arrived in Japan in 1999 after finishing the study and resumed here her model and actress career that started at the age of 8. Abigail McConnell is known for her work on The Rise of Eina (2011), Dark Roads (2010) and Meet Me in Space (2009). Alana Husband was born on October 21, 1984 in Bridgetown, Barbados. She is known for her work on X2: X-Men United (2003), Freddy vs. Jason (2003) and Battlestar Galactica (2004). Abby Wathen is an actress and producer, known for Wedding Dress (2015), Random Encounters (2013) and All My Children (1970). Alexandra Mingione is an actress, known for The Afterlife (2013), Isn't It Delicious (2013) and Hell's Caretaker (2013). Actress | Naar de klote! Afke Reijenga was born on March 26, 1969 in Waalre, Noord-Brabant, Netherlands. 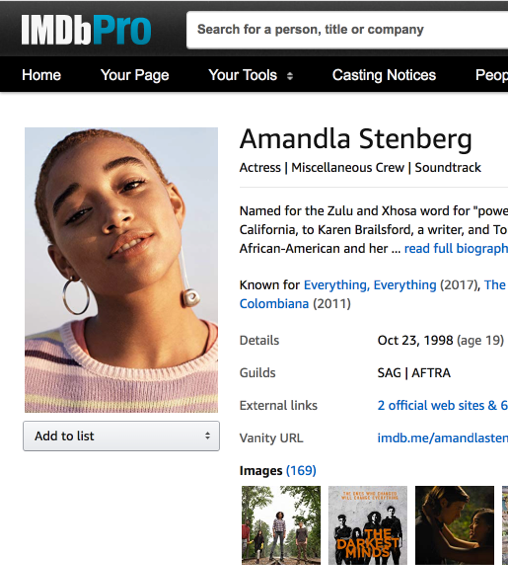 She is an actress, known for Wasted! (1996), Baantjer (1995) and Onderweg naar morgen (1994). Alexandra Billings was born on March 28, 1962 in Schaumburg, Illinois, USA. She is an actress, known for Transparent (2014), Socket (2007) and Eli Stone (2008). Alexandra Mathews was born on April 25, 1990 in Santa Monica, California, USA as Alexandra Fatima Mathews. She is an actress, known for Left 4 Dead: Impulse 76 Fan Film (2011), Organize Chaos (2014) and The OG Girls (2012). Aggy K. Adams is an actress, known for Oh, Ramona! (2019), World War Z (2013) and Undercover Hooligan (2016).